The Southern Jazz Combos at Missouri Southern State University has scheduled performances for Thursday, Nov. 17, and Friday, Nov. 18. 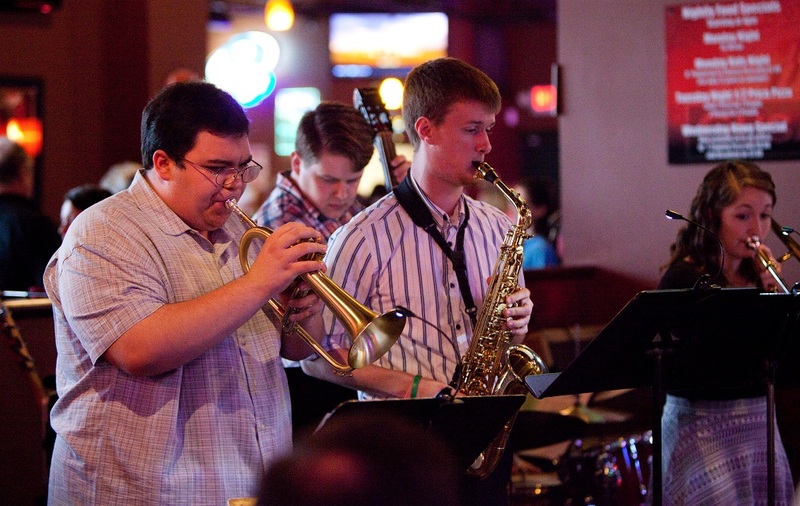 Jazz students perform at Gusano’s in 2015. The combos will perform at 7:30 p.m. Thursday, Nov. 17, in Webster Hall’s Corley Auditorium. The concert will feature four student groups offering a variety of selections including “Take the A Train,” “In a Sentimental Mood,” “Bye Bye Blackbird” and others. The jazz combos will also perform starting at 6 p.m. Friday, Nov. 18, at Gusano’s Pizza, 3929 E. Seventh St.
“It’s an opportunity for people in the community to listen to our jazz combos in a more relaxed atmosphere,” said Dr. Phillip C. Wise, director of jazz studies at Missouri Southern. The Gusano’s performance is free; however, people are encouraged to make reservations in advance by calling the restaurant at 417-623-9090 and requesting seating near the musicians.